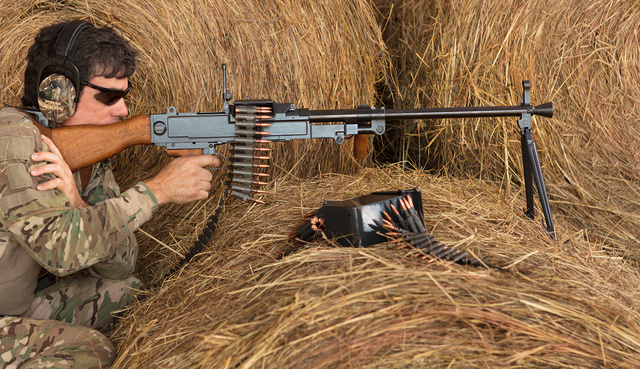 UK59 (“universal machinegun”) in 7.62x54R shows obvious ZB26/Bren features, but adds a unique cocking with the movable pistol grip. It also has the infamous shoulder thingie that goes up. My friend tells me that hay bales are actually quite good at stopping bullets, so settling into one for a firing position isn’t crazy. This entry was posted in ammunition, rifle, weapon and tagged 7.62x54, Czechoslovak, machine gun. Bookmark the permalink. I wonder how the hay bales work out when hit by tracers? It also has the infamous shoulder thingie that goes up. I’m not seeing a barrel shroud. Hay bales can catch on fire with just regular ammo rounds. Not a good thing!